A parliamentary report of 1777 recorded parish workhouses in operation at Braintree (with accommodation for up to 60 inmates), Bradwell (13), Black Notley (16), Bocking (140), Finchingfield (25), Stisted (20), and Weathersfield [Wethersfield](25). The vestry clerk shall keep a register of all vagrants. No money shall be given to vagrants. No vagrant shall be omitted without a ticket signed by a parish officer. Set menus to be provided which will comprise bread and beer for all meals. All persons shall be discharged every morning in summer at 6 a.m. and in winter at 8 a.m.
Vagrants found begging in Braintree shall be apprehended. Vagrants shall he searched on entry with any money or personal possessions passed to parish officers. Children under six years of age are allowed to sleep with their mothers. On the west side was a watch-house, committee room, women's room, dining-room, kitchen and pantry with bedrooms above. On the south side was a general room, pantry, cellars and men's workshop. There were bedrooms above. On the east side there was a wood house and coal house, a mill house and wash house with also a cart shed. All these buildings would have probably have been of wood construction and in a yard. On the north side were the entrance gates, travellers room, grinding house and tool house. There was also a brick cage (small prison buildings) built into this north side. 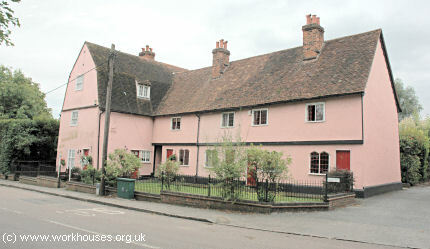 Bocking had a parish workhouse on Church Lane, near to the bridge over to Bocking Churchstreet. 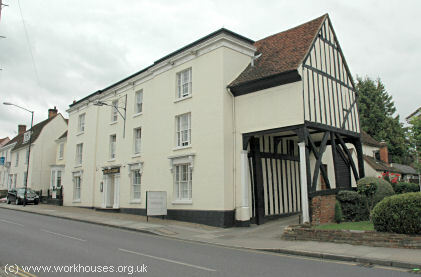 The building appears to date from 1500 but was used as a workhouse from the 1720s. The reported capacity of 140 reported in the 1777 parliamentary survey, if accurate, would have made it one of the largest in Essex. 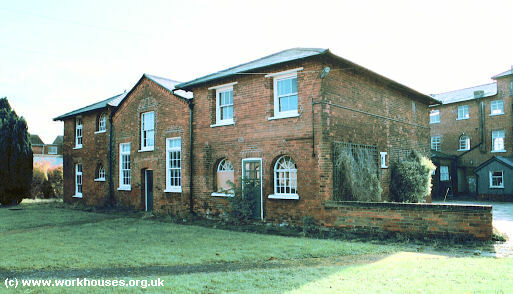 Bocking's former parish workhouse, 2006. The Finchingfield vestry agreed to erect a new parish workhouse in 1763 but may instead have resorted to using an existing building. 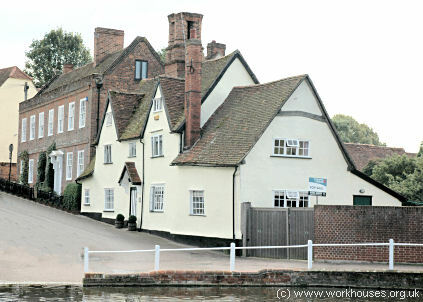 These premises, located next to the village pond, are now known as Bridge House. A late eighteenth century inventory of the workhouse mentions rooms including a governor's room, dining room, dwelling room, ward, buttery, brewhouse, coalhouse, governor's chamber, first chamber, hall chamber, first garret, and second garret. Eliza Vaughn, in her 1926 book The Stream of Time gives an account of the final years of the workhouse. Inmates were employed in cultivating hops in a field known as the Hop Ground. The much-feared master of the workhouse wore a smock with grey breeches and stockings. When, as often happened, inmates ran away from the workhouse, he would take a whip and search for them. 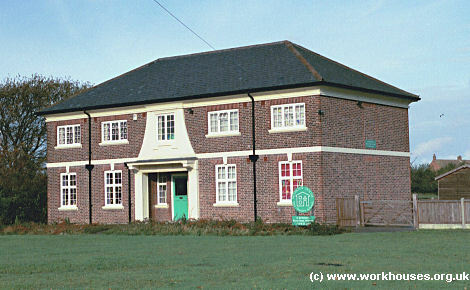 Finchingfield's former parish workhouse, 2006. Wethersfield's parish workhouse was in operation by at least 1727. In 1729, it had eleven inmates in residence. Robert Carter was appointed master at a salary of 7s.6d. per week to maintain seven paupers in "meat, drink, washing and lodging". An inventory of 1792 records eating utensils for up to 20 inmates. The contents of three storey building also included a spinning wheel in the Great Bed Room, and another in the Wool Room. A house on The Green is thought to have been served as the workhouse. 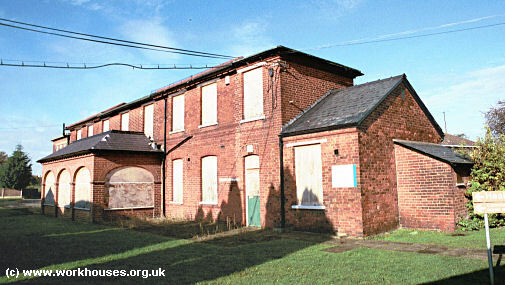 Wethersfield's former parish workhouse, 2006. Essex: Black Notley, Bocking (4), Bradwell, Braintree (4), Cressing, Finchingfield (2), Great Saling, Pattiswick, Penfield, Rayne, Shalford, Stisted, White Notley, Weathersfield (2). The population falling within the union at the 1831 census had been 15,097 — ranging from Panfield (population 316) to Braintree itself (3,422). The average annual poor-rate expenditure for the period 1833-35 had been £13,448 or 17s.10d. per head of the population. The new Braintree Board of Guardians invited the submission of workhouse plans for four architects: Sampson Kempthorne, Mr Pennice (a Colchester architect), Mr Watson (a local builder), and William T Nash (an architect based in Royston). The plans eventually adopted were those of Nash, who also designed workhouses at Buntingford, Royston, Halstead, St Ives, and Caxton & Arrington. Nash's design for Braintree was based the popular hexagonal plan and similar to that used at Bishop's Stortford where Nash had been acting as surveyor. In 1837, Braintree was the scene of an event that was reported by The Times on 29th April. On Monday last a spirit of insubordination manifested itself among the able-bodied paupers in Braintree workhouse. About 80 men went to work as usual in the morning at the mill, and continued to do so quietly until breakfast time, after which they refused to return to the work unless each had half a pound more bread per day, and something was said about some small beer. The officers were directed to prefer a complaint before a magistrate, and seven of the number were taken before George Nottidge, jun, Esq., who committed William Larkin, William Unwin, William Dee, and Jesse Gunn, to the convict gaol, Springfield, for 14 days hard labour. The other three were sent back, in the hope that the example of the four who were sent to prison would be communicated by them to their companions, and that order would be restored. This expectation, however, was by no means realised, and the Board found it necessary, in the course of the day, to make an order, under the workhouse regulations, that the turbulent should be kept on bread and water until they went to work, or until the next Board day of meeting. The order was read to the men the following morning, but instead of quieting them, it appeared to excite increased noise and symptoms of riot. As special session was, therefor, convened. Twenty-four men and boys (six of them married, 10 under 21 years of age, and the others of various ages, the eldest being 48, all of them apparently in good health, were then brought before them, and proof of their refusal to work, with the cause assigned, was adduced by the miller, and corroborated by the matron. The Dietary Table was produced, by which it appeared that the allowance per head is as follows:—16 ounces of bread, a pint of porridge, potatoes at dinner without stint, and one ounce of cheese, every day; in addition to this they had, two days in the week, a pint and a half of soup; two other days, five ounces of cooked meat; two others, and additional ounce of cheese, and the remaining day 12 ounces of suet pudding. The pauper were then called upon for their defence. Their principal spokesman was a man named Reed. Reed stated that they struck for half a pound more bread per day, and a little small beer; that one of them, a young man, was almost dying from drinking water when he came off the "wheel" (as he termed the hand corn mill). He further complained that when they went out on Sundays, they were obliged to return at half-past 4, or be treated like prisoners, which ought not to be the case, he said, in a free country; that they were called paupers, which they did not consider themselves to be, as they worked for their living (meaning at the hand corn-mill, it is supposed); that they had not food enough as working men, or even for men who did not work; and that they were treated as slaves, although slavery had been done away with in foreign parts. After a lengthened discussion, the Bench said they were perfectly satisfied that the allowance of food was sufficient, and if it were not so considered by the paupers, it was for them to complain to the guardians, and not to refuse to work. They were inclined to think that the accused had acted under a wrong impression, and were willing to stay further proceedings against them, if they would return to their duty. This appeal, which was particularly directed to reed, appeared to have no effect on him or his companions; and the Bench then sentenced three boys to 14 days' hard labour in the Halsted gaol, and others to different periods of imprisonment and hard labour. At starting they were cheered by a large concourse of weavers &c., who were loud in their expressions of encouragement to the paupers during the investigation. The Magistrates, on leaving the bench-room, had to encounter some new symptoms of disapprobation on the part of the mob. The new Braintree workhouse, for 300 inmates, was built in 1837-8 at a site to the west of Braintree on the north side of Rayne Road. The Poor Law Commissioners authorized the sum of £6,342 for the its construction which was carried out by the firm of Steggles and Son. The heating and cooking facilities were fitted by the London firm of Eckstein and Son, at a cost of £235.10s. The Board of Guardians first took possession of the premises in March 1838. The original workhouse layout can be seen on the 1876 map below. The view below dates from around 1905. A few of the workhouse residents can be seen in the detailed section. 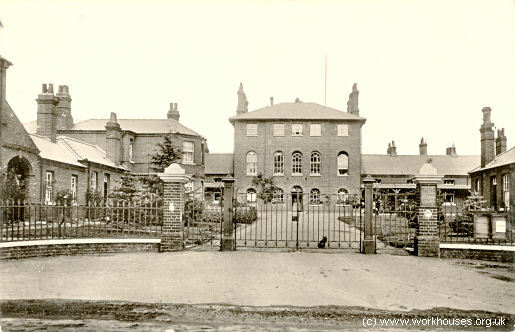 Braintree workhouse general view from the south, c.1905. The three-storey entrance block at the front contained the original porter's room and receiving wards on the ground floor, and the Guardians' board-room on the first floor. The infirmary wards that now flank the entrance block date from around 1905-10 and replaced the original single-storey wings. The new wards could once be opened to the front and were used to accommodate TB patients. Braintree entrance block from the south, 2000. To the rear of the entrance block were the dining hall and chapel. These connected to the hexagonal central hub which contained kitchens of the ground floor, with the Master's quarters above. Also connecting to the hub were the two main accommodation wings for the different classes of inmate, with male wards at the west, and female wards at the east. The workhouse laundry was located at the end of the female wing, and the bakery at the end of the male wing. Next to the bakery was a corn-grinding mill. Powering the mill from the adjacent 'crank room' was one of the tasks used to provide work for the inmates. Other inmates were occupied in picking oakum . Braintree accommodation wings from east, 2000. The original workhouse infirmary stood at the north of the workhouse. 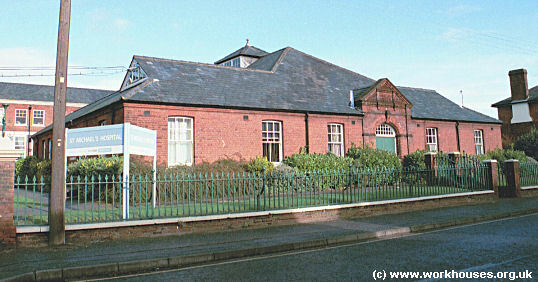 Braintree original infirmary from the north-west, 2000. In 1840, to celebrate the marriage of Queen Victoria, inmates were allowed a pint of strong beer, half an ounce of tobacco with a pipe, and some tea, sugar and snuff. In the census of 1841 there was a total of 162 inmates, around half the workhouse's capacity. There were 46 boys and 22 girls aged 15 or less and eight women over 60. The largest group of inmates were those of 'no occupation'. There were twenty agricultural labourers, almost all over 60. Ten years later, in 1851, there were 276 inmates, including 62 agricultural labourers aged 12 to 60, and 31 house-servants. 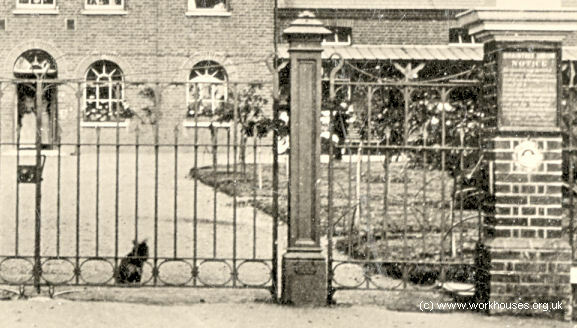 In the mid-nineteenth century, a new infirmary was erected to the north of the workhouse. It was originally U-shaped but was later infilled and had a central added at the south. Braintree later infirmary the south-east, 2000. In 1894, the British Medical Journal set up a "commission" to investigate conditions in provincial workhouses and their infirmaries. Following a visit to Braintree, the commission's report was broadly favourable. It did, however, make a number of criticisms about the various buildings used for accommodating the sick, which were all overcrowded. Ideally, a new infirmary for 100 or more beds was needed. Additional nurses were also required, although until a new building had been constructed, there was nowhere to house them. Further details are available in the full report. In 1895-6, new buildings were erected at the front of the site, with porter's lodge, receiving wards and casual cells at the west, and a new board-room at the east. Braintree new reception block from the south, 2000. Braintree new board room from the south, 2000. 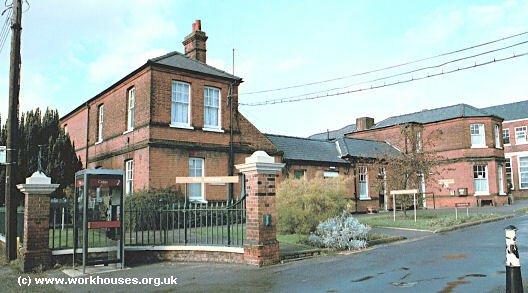 A nurses' home was erected at the north-west of the site in 1930. 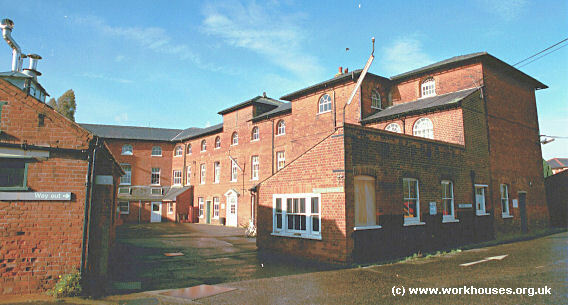 The workhouse later became St Michael's Hospital. By 2000, parts of the main block were being used for geriatric care, but most of the upper floors and out-buildings were no longer in use. The hospital closed a few years later and in 2008 was converted into luxury flats. 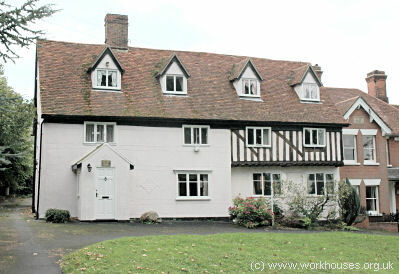 From 1908 to 1915, Poplar Hall, on Hatfield Road, Witham was used by the Braintree Union as a children's cottage home. In 1915, a new cottage home was established in a house known as Friars, at 31 Bradford Street, Bocking. In recent times, the property has served as the Old Court Hotel. 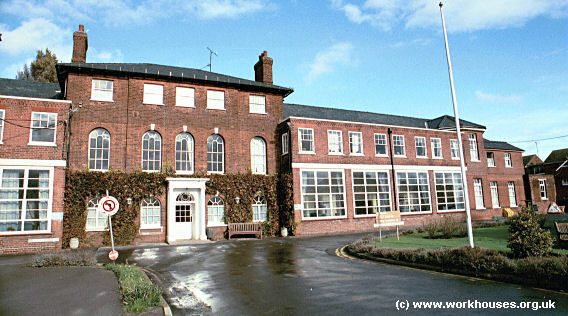 Braintree former union children's home, 2006. Essex Record Office, Wharf Road Chelmsford CM2 6YT. Holdings include: Guardians' minutes (1835-1930); Admissions and discharges (1883-88, 1891-4, 1897-8, 1926-9); etc.